Richard Bennett, Northampton, England; sold 1911 to (Gorer, London); (Dreicer and Co., New York, agent for Gorer, London); sold 1914 to Peter A. B. Widener, Lynnewood Hall, Elkins Park, Pennsylvania; inheritance from Estate of Peter A. B. Widener by gift through power of appointment of Joseph E. Widener, Elkins Park, Pennsylvania; gift 1942 to NGA. 1942.9.535, but its paler green tone makes the effect less immediately apparent. 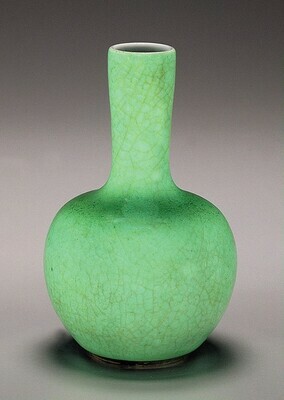 What is more noticeable is the crystallized appearance of the glaze, particularly at the shoulder. Occasionally the green enamel extends over the underlying grayish white glaze onto the foot, and upward to the top of the exterior mouth rim. The crackle in the underlying glaze is quite wide, and it does not appear to have been stained. The unglazed, wedge-shaped foot is covered with a light brown slip, some of which has worn off. The base and interior are covered solely with the grayish white glaze. Gorer 1911, 75, no. 379. Works of Art from the Widener Collection. Foreword by David Finley and John Walker. National Gallery of Art, Washington, 1942: 22. Bower, Virginia, Josephine Hadley Knapp, Stephen Little, and Robert Wilson Torchia. Decorative Arts, Part II: Far Eastern Ceramics and Paintings; Persian and Indian Rugs and Carpets. The Collections of the National Gallery of Art Systematic Catalogue. Washington, D.C., 1998: 108-110, color repro.